Link checkers are always handy, whether you’re interested in optimizing your site for the search engines or not. After you’ve created a few pages, run a link check to make sure you didn’t make any mistakes in your links. This program is very quick — checking tens of thousands of links in a few minutes — and very easy to use. 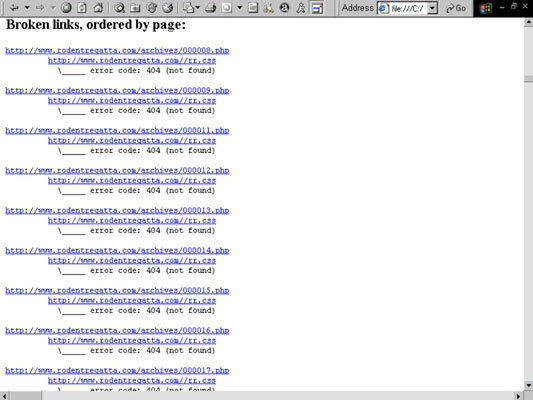 It produces a report, displayed in your web browser, showing the pages containing broken links. Click a link, and the page opens so you can take a look. You can use the program to check both internal and external links on your site. Note also that your web design software package may include a built-in link checker.